The tax cuts President Trump signed into law have helped start a party on Wall Street. But the celebration may not last long. There's little doubt that the massive business tax cuts will provide an instant and sizable boost to corporate America's already booming bottom line. The tax law is likely to improve the earnings per share of S&P 500 companies by 10.5% this year, Bank of America Merrill Lynch predicted Wednesday. Most of that comes from a sharply reduced corporate tax rate. The rest comes from companies spending their tax savings on stock buybacks. Wall Street eagerly anticipated this tax bonanza. Expectations for stronger profits helped send stock prices soaring in 2017, and they've gone even higher early in 2018. Trump himself predicted on Twitter on Wednesday night that the stock rally still has "tremendous upward potential." That may be true. The bulls are betting that enormous tax savings will combine with the rejuvenated economy to accelerate corporate profits, the engine of the stock market, beyond 2018. But Bank of America is warning that may be too optimistic. "We see several reasons you could get the opposite: Strong earnings growth in 2018 marks the peak of growth and it slows down significantly thereafter," said Dan Suzuki, senior investment strategist at BofA. BofA projects stellar profit growth of 16% this year, but the firm's new forecast for 2019 implies a deceleration to 5%. One reason: Few economists believe the tax overhaul will create the long-term economic boom that Trump envisions. 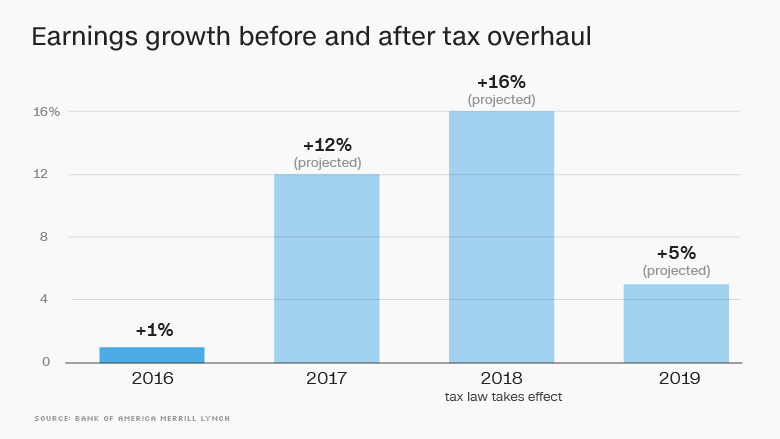 Moody's predicts the tax law will only help "modestly," boosting economic growth by 0.1 to 0.2 percentage points. BofA sees a slightly bigger boost, but expects growth to slow in 2019 to 2.2% to 2.3%. That wouldn't be good for corporate profits or the stock market. Interestingly, one of the reasons BofA anticipates a slowdown in earnings is the tax law itself. 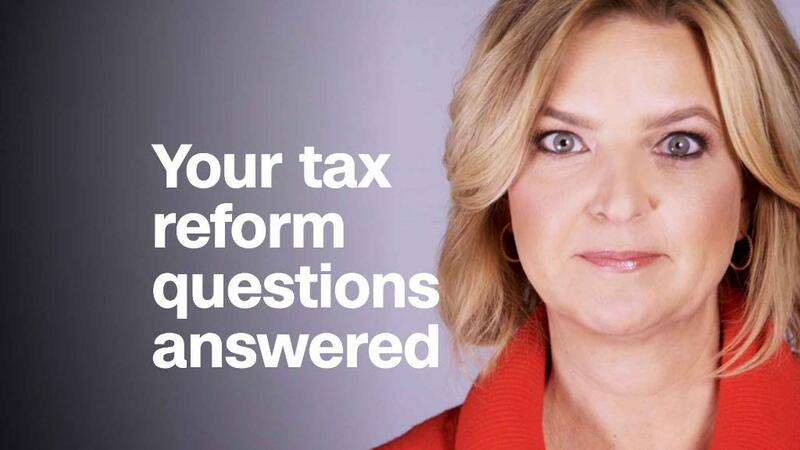 "Tax reform could be a headwind to growth in 2019," the report warns. Why? First, Suzuki explained that companies will find it difficult next year to live up to their stellar growth of 2018 once the tax benefits are phased in. Another problem: Many of the biggest beneficiaries of the tax law, such as consumer companies and telecoms, are facing "heightened competition as well as disruption." Netflix (NFLX) has led cable subscribers to cut the cord. Amazon (AMZN) has upended brick-and-mortar retailers and now grocery store chains. Suzuki said basic economic theory suggests that higher returns on investment caused by the tax law will allow companies to cut prices, chipping away at profits of more established companies over time. The other obstacle that Wall Street needs to navigate is the Federal Reserve. If the tax law does accelerate economic growth, the Fed will come under pressure to scrap its promise to raise interest rates at a gradual pace. Some Fed officials hinted at that risk at the central bank's December meeting, according to minutes released on Wednesday. Accelerated rate hikes could "eventually weigh on overall economic growth" by increasing borrowing costs, BofA said. Erin Browne, head of asset allocation at UBS Asset Management, cautioned clients in a recent report that Trump's decision to "launch fiscal stimulus" with low unemployment and solid economic growth is a "recipe for a surge in wage growth." While higher paychecks would be welcomed by many Americans suffering from years of stagnant wages, Browne said a sharp influx of inflation would likely cause serious pain in the bond market that spreads to other asset prices. So what does all this mean about the future of the eight-year bull market in stocks? "We're not making the call that a bear market is imminent," said Suzuki. He pointed to how almost half of BofA's list of 19 "bear market signposts" have not yet been triggered. Two of the red flags that haven't been raised are signals of excessive optimism among investors. But Suzuki conceded that the tax cuts could "drive investor sentiment into euphoric levels, which would be very bearish for the market eventually."